I've been wanting to visit Bekonscot Model Village for a long time. Longer even than since my first trip up to the Midlands to visit my husband's parents, when I first saw the Model Village sign from the M40. 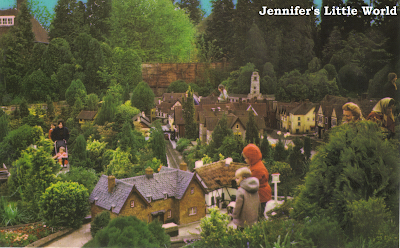 In fact I first encountered Bekonscot Model Village on a couple of old postcards which I picked up in a charity shop years ago. Old postcards aren't something that I normally buy, but for some reason these two caught my eye and they've been in my collection ever since. Every time we've been up to the in-laws I've remarked that we really must visit sometime, and after spending this weekend up north with nothing in particular to get back home to, we decided that today was the day! We paid £9.50 per adult and £5.50 per child (under 2s are free). Tesco Clubcard vouchers are accepted, which we would have used if we'd been more organised. This includes admission to the model village, with a ride on the railway costing an additional £1 per person. 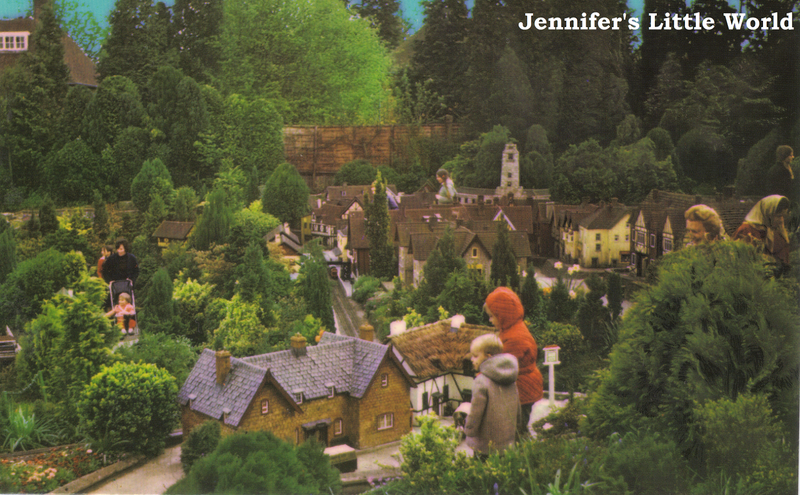 Bekonscot Model Village is the oldest original model village in the world, and opened for the first time in 1929. Although the attraction was updated with modern buildings over the years, in 1992 it was returned to a village stuck in the 1930s. An extensive miniature railway network criss-crosses the village, and many of the models also have moving parts, like the funfair and children's playground. The model village is set over a large area, connected by little paths. It's wide enough to walk with a pushchair, although Mia walks well enough now that we only really use one for carrying the sandwiches. Harry and Mia were so excited when they arrived, and when they realised that there were miniature trains running in between the buildings they couldn't be kept still, and were quite literally jumping up and down with excitement. We walked around the model village twice because there is so much to see, and there was plenty that we had missed the first time around. It's worth knowing that everything at Bekonscot is outdoors, so if you can try and visit on a dry day! We had a really lovely day out at Bekonscot, and I'm so glad that we managed to visit in the end. Finally, here's one of the old postcards which inspired me all those years ago. Doesn't it look magical? Oh, I love model villages. I think there is something really special about feeling so much bigger than buildings, and probably doubly so for small children! We went to Babbacombe on our recent holiday in Decon, and Thomas definitely loved it! We love Bekonscot! I grew up just down the road, and we were lucky enough to be invited to review it on the blog last year. Will have to re-visit next time we're at my mum's! I used to love model villages, I really must get round to taking my little man to one. This one looks brilliant.